Will you Shut Up and Write!? From September 2016 The Graduate School are holding a new monthly 3 hour writing cafe called Shut Up and Write! The first one is on September 28th and I will be facilitating, along with Nikki Woods from Learning Development. 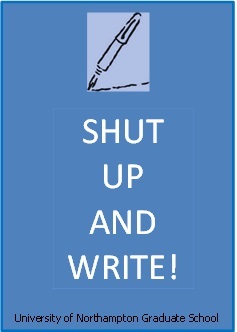 The concept of Shut Up and Write! originated in the San Francisco area among creative writers, but, thanks to social media, this has spread to research students around the world. Shut up and Write! turns writing from a solitary to a social experience and involves small groups of writers getting together to have coffee (or other beverages), offer support, chat for a short while, then shut up and get down to do some writing! We will introduce the concept to you in this session and let you try it out for yourself in two (nearly three!) 45 minute Pomodoro-style free-writing sessions. If you are a University of Northampton Postgraduate Research Student (or researcher) why not come along. All you need to do is bring your lunch, pen and paper or laptop and ideas on what you wish to write about in the session. We provide the refreshments. You can find out more information here on the booking page. Alongside the cafe sessions we have also launched a SU&W Padlet. Take a look at some online writing resources, perhaps share some of your own writing resources and leave your research biography for others to see. Posted on August 19, 2016, in Events, Researcher development and tagged academic writing, Free writing, Pomodoro technique, Shut up and write!, writing cafe. Bookmark the permalink. Leave a comment.